The City of Chicago is pleased to announce that this year’s official Chicago Christmas Tree is a 69-foot Norway Spruce donated by the Scholla family of Wauconda, Illinois. 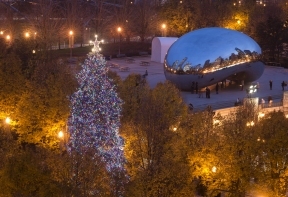 The tree will shine in Chicago’s iconic Millennium Park (Washington St. and Michigan Ave.) this holiday season, surrounded by the city’s skyline and other Loop holiday attractions. 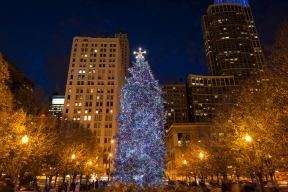 The official 103rd Annual Chicago Christmas Tree Lighting is on Friday, Nov. 18th. The free event begins at 6 p.m. with performances headlined by STOMP, cast members from Rudolph the Red-Nosed Reindeer the Musical and more. The 103rd Annual Chicago Christmas Tree Lighting ceremony will begin at 6 p.m. The program will feature a special performance by cast members from STOMP, the international percussion sensation making noise for over 20 years in London, off-Broadway and on tour. STOMP will be at the Broadway Playhouse at Water Tower Place through January 1. For performance details, please visit www.BroadwayInChicago.com. Santa Claus will also set up in Millennium Park this holiday season, available to children of all ages to hear wishlists and take pictures (with your own camera or smartphone). Admission is free. Special visits with Santa Claus begin on Friday, Nov. 18th, from noon until 6 p.m. and on Thanksgiving Day from noon to 3 p.m. He will be available for regular visits from noon until 6 p.m. on Saturdays and Sundays, November 19–December 18. The McCormick Tribune Ice Rink at Millennium Park will open earlier in the day on Friday, November 18, at noon and will offer ice skating in the park through March 5, weather permitting. For complete details on these events and others including caroling at Cloud Gate and the Dance-Along Nutcracker, visit cityofchicago.org/holiday. For information about Millennium Park, visit millenniumpark.org, call 312-742-1168. For information about programs presented by the Department of Cultural Affairs and Special Events, visit cityofchicago.org/dcase, call 312-744-3316.